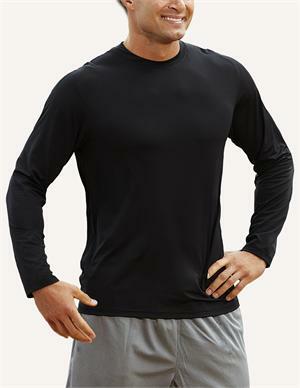 This long sleeve crew neck is made with 90% MicroPolyester/10% Spandex blend to create this sofe fitted shirt that is very comfortable and stretch fit. The smooth neckline is ideal for layering under clothes and also as a stand alone piece. Offered in our hi-cool technology to keep you dry and controlling moisture buildup. The matte-finish reduces bulk when layering which allows for easy movement.